Soul and inspiration, part 2: Should you ink a name? One of our cats died early Thursday morning, after a long illness. And thus, today’s entry is about one of the most profoundly personal of all tattoos, one designed as a memorial for a lost loved one. From the simple addition of someone’s name, to something as elaborate as my nephew’s back piece that serves as a memorial for his fallen colleagues in Iraq and Afghanistan, the placement of an image to honor the loved and lost can be among the most satisfying of decorations. It is important, though, in the decision to get a memorial tattoo, that one not act too much in haste. Taking proper time to think, consider, and allow the first sharp pain of the loss to die away a bit is essential to getting the very best design. Would a portrait be appropriate? You will need to find an artist who specializes in portrait work, for the best results. Would a picture of something else do better? Would it be enough to just have a simple “In Loving Memory” with the person’s or pet’s name and dates? How large a design do you want, and where should it best be placed? Even more so than with other designs, a memorial should be the product of careful consideration. My dragon tattoo is in honor of my grandmother, and it took me about a year of thinking, drawing, and re-drawing to get the design perfected. I didn’t put her name on it, but I did have the artist add a very tiny Chinese character for “woman” underneath. When a Chinese friend saw the tattoo for the first time, he said “Oh, it’s a GIRL dragon.” I’m sure my grandmother, who always thought that she was the reincarnation of a 9th century Chinese poet, would have smiled at that. This blog, by the way, is partly my memorial to our cat. 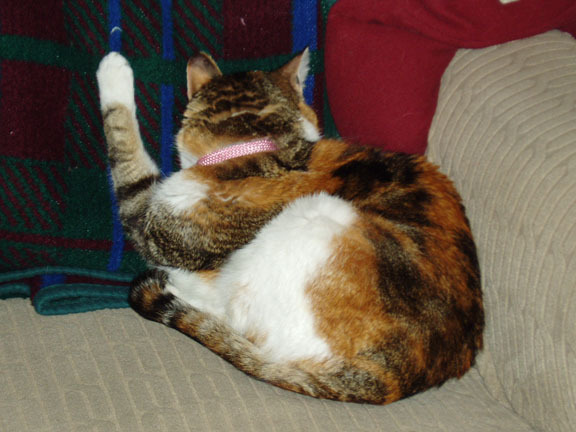 Her name was Calypso, and she was a calico, and I often called her “Multicolor” in honor of her lovely fur. They really are very nice ornaments and would make a nice remembrance or gift. That is a pretty intense dragon, and a nice permanent reminder of your granddad. Looks like not only did you take a long time to get it just right, but the artist took his time with this one too; it looks great. Thats really nice of you! That’s a lovely story about you and your grandmother. And what a wonderful way to remember her always. I have often thought that my grandmother would be pleased that I’d gotten a dragon tattoo. Her father had a dragon tattoo, too, but I didn’t find out about that until after I’d had mine done. I love the story about the rememberance tattoo. I recently lost my gram who would have been 98 on Christmas day. I was out of town on vacation when she passed, and not with family. During the last 8 years of my grams life I tried to take her to do things she had never done, seen, or heard before. And we had alot of fun. One of the things I would always say to her when I picked her up was “What do you wanna do today gram, shall we go get tattoos?” Then she would always laugh, and say to me, “Oh, your mother would just s–t if we did that.” My gram was tiny italian lady whose life had always revolved around her garden. And in the late fall it was of highest importantance to select her winter pansy stock to plant. So while I was on vacation, I had a tatoo of a pansy put on my left chest. I have a book at home called the language of flowers, and for the Pansy, it says, “think of me with happy thoughts always.” My tattoo couldn’t have been more perfect, and I am so happy I got it. My mom recently took flowers to my grams grave side, and I happily thought to myself, “I am grams flower every day.” And every day I think of her and the great love and fun we shared.